I designed this for use on a logo concept I was working on. Didn't work so well for the logo, but I was able to work it into a system. The objective was to use a small grid and limited number of bricks... But the real challenge was try to keep the words readable without any space between the letters. Info: Created on 25th June 2010 . Last edited on 1st June 2011. You have succeeded in your efforts. Congratulations! FontStruct Staff have deemed your FontStruction worthy of special mention. “Dradis” is now a Top Pick. Wow! Great job. It's really original and interesting. This is the kind of font I can just look at for about five minutes on end without doing anything but examining the font. It's absolutely excellent, for such a simple font. 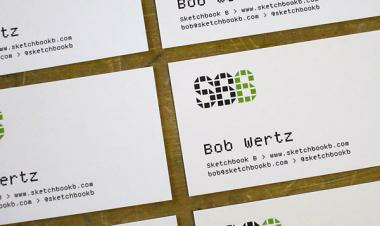 Actually used Dradis on my new business cards. 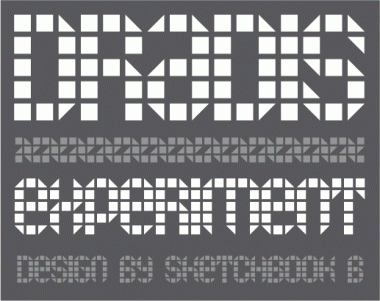 The other font is another one of my Fontstruct creations, Periodic.